This interactive quiz has been created as a companion to my “A Tank by Any Other Name” article. Using the information given there, you should be able to determine which of the following vehicles are tanks and which are not. This is a Finnish Leopard 2A4 main battle tank, made in Germany. This is a British FV510 Warrior infantry fighting vehicle. Note the small turret relative to the hull size, and the gun barrel is thin, indicating that it is of small calibre. This is an American M113 armoured personnel carrier. Note the lack of turret. This is an American M48 Patton medium tank. This is a Belarussian BMD-1, an infantry fighting vehicle which is small and light enough to be dropped by parachute. This is a Russian T-62M main battle tank. This is a British Centurion III main battle tank. This is a Russian 2S19 Msta self-propelled howitzer. Note the very large turret. 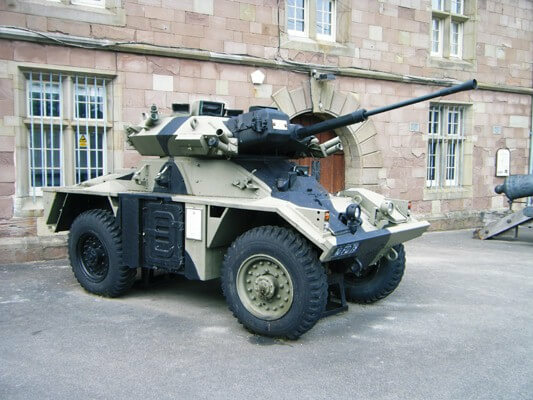 This is a British Fox armoured car. The turret is large compared to the hull, but the gun is of small calibre, and the vehicle is wheeled, not tracked. This is a Japanese Type 74 main battle tank. You have answered 0 of 0 correctly.